RoCkaNdFRoCk: CaN't TaKe My EYeS Off oF YoU. Hope you'll have a great day honeys, here in Rome we are waiting for the snow!!! And the weather is sooooo cold. its the same with me! im so bad at make-up! Eye make up is going that I need to get better at as well. Thanks for the inspiration Valeria! LOve wearing make up, foundation, lipstick always!!!! Sometimes, let's say twice a year I put some effort and do my make up really great. All other 363 days I put the basics...and that's enough, so don't worry about make up!!!! Wow!! I love make up! Amazing eyes, nice post! I´m following you now on GFC and bloglovin! Questi effetti sono fantastici e ti giuro che ero una capra anche io, basta prenderci la mano! I usually go with subtle and discreet make-up for eyes. :) And just like you, I prefer the lipstick to the gloss. Here in Toronto we actually have a really nice winter this year, no big snows, no low temperatures, it's amazing. I hope February will not be very cold. I'm not that great with makeup either. See it's not just you. Ma durante la settimana lavorativa, il minimo indispensabile. Non ho proprio tempo! 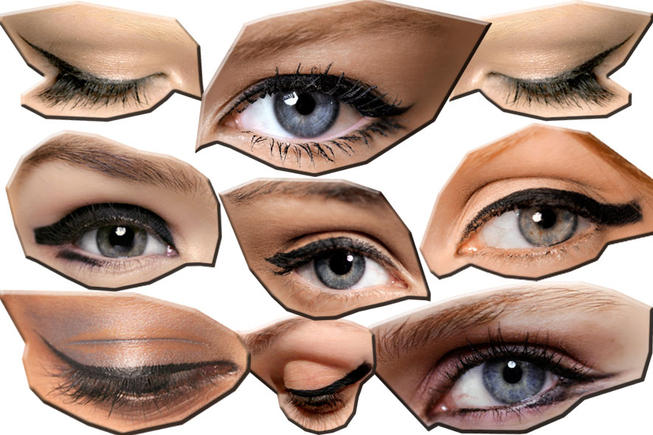 I love these eyeliner techniques! Thanks for following back dear!!! Anch'io come te, non mi trucco quasi per niente ma c'è un prodotto a cui non rinuncio Touch Eclat di YSL, l'ho vinto anni fa in aereo e da allora lo continuo a ricomprare! Anch'io mi trucco poco e uso lo stretto necessario. Niente fondotinta, mi fa sentire il volto pesante, eyeliner come nella foto che hai messo tu in questo post e ogni tanto mi diverto a cambiargli forma,matita all'interno dell'occhio,mascara e un leggero tocco di terra sulle guanciotte. Bellissimo blog, ti seguo anch'io! Great blog! Would you like to follow each other :) ? complimenti a te, per il blog. Un consiglio per l'ombretto: un paio di pennellini professionali, uno con le setole lunghe per stendere e sfumare, uno con setole corte e compatte, per definire e disegnare il contorno degli occhi: fanno davvero miracoli! the same happens to me...I wish one day to learn how to use correctly the cosmetics! !hahaha.Thanks for your sweet comment!I m following you !you have an adorable blog! I am not good with make-up too! And I love lipsticks too.. I am now following you. Please check out my blog if you have a minute thanks.